﻿The Body Suit was a popular item of clothing in the 1970s. 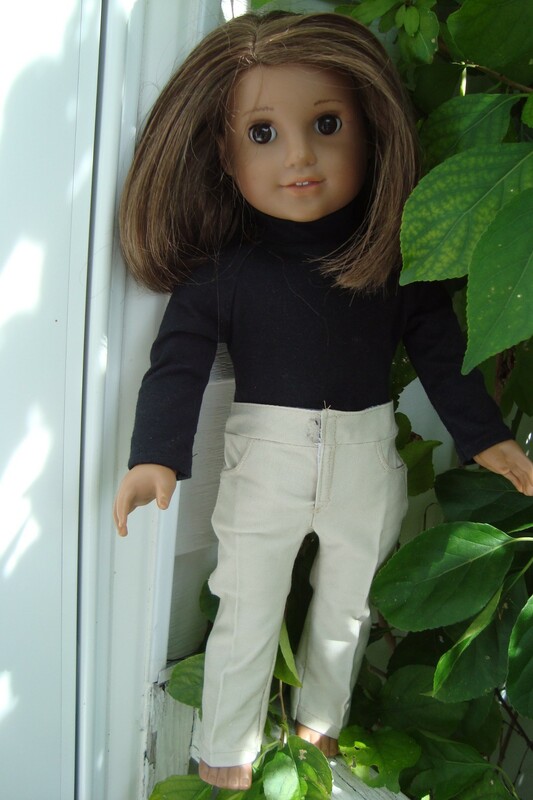 These long-sleeved, fitted stretch turtleneck tops connected between the legs to stay tucked into skirts, slacks, and jumpers. The Flossie Potter 1970s Body Suit is based on that style. 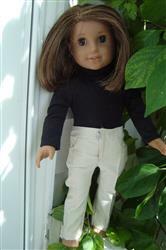 It also features raglan sleeves and a wide, fold-down turtleneck collar (rather than a mock-turtleneck). The PDF sewing pattern contains 12 pages of full-color step-by-step instructions, 3 pages of summary instructions (to save on printer ink), and 4 pages of full-size pattern pieces. Pair the Body Suit with the Flossie Potter Hip-Hugger Bell Bottoms or the Genniewren Swirly Pants. I love to wear bodysuits myself, so I was very excited to see this pattern. It was so much fun to make. The directions were really great and it turned out so well. I used a tee shirt for the fabric choice. It was one of those projects that make you happy because the end result is so much better than the amount of effort involved. 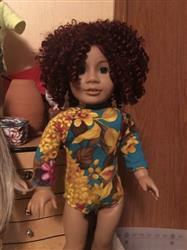 Most of the time, I sew doll clothes because I see something new and cute on Pixie Faire. But, sometimes I need something in particular. I needed a turtleneck top, and this one has a real turtleneck, so you can make it as high as you need it. I needed tight sleeves to go under a jumper, which would ultimately go under a coat. So I needed something that wouldn't add bulk under all of those layers. The outfit also had tights, and I wanted the bodysuit feature to keep the tights up and smooth under the jumper. This pattern had all of the elements I needed. And it had a flat application closing which also helped reduce the bulk. As with all of Flossie's patterns, the instructions were clear and the fit was great. I've made three of these so far and I'm impressed. The directions are very clear and thorough. The fit is perfect. I used knit ponte and it worked just fine. I really like this pattern.